Warning: Graphic images of animal neglect and abuse. 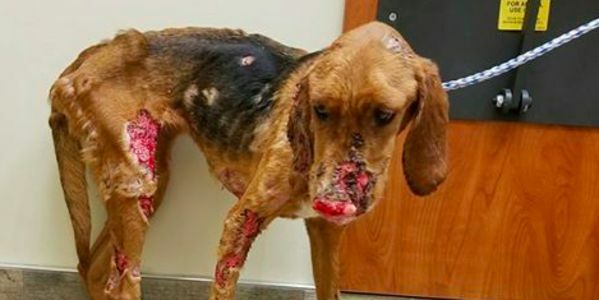 A poor hound dog named Sami was found hobbling along the road in Florida, after apparently suffering many months of starvation and animal attacks in the woods. It appears that some hunters threw her out of a car because she wouldn't hunt and then left her for dead. This is dispicable animal abuse and we can't let the perpetrator get away with it. Sign my petition to urge the authorities to find the person responsible for Sami's abandonment. Same was practically skin and bones when she was found, signifying that she probably starved for many months in the woods. It appears that she had suffered attacks from other animals as well, which were bleeding and festering because the lack of medical attention she received. Thankfully Sami is still alive and fighting to stay that way with the help of a local rescue. It's so disgusting that Sami was left for dead because she wouldn't hunt for someone. But apparently that happens all the time in this area of Florida. That's why we must insist the authorities take this animal abuse seriously, so as to dissaude other people from doing the same cruel thing. We still don’t know who did this to Sami. Let’s keep the pressure up! If you’d like to follow Sami’s recovery, you can follow her journey here.